That was the question explored in research presented last week by Heather Ruetschlin Schugar, an associate professor at West Chester University, and her spouse Jordan T. Schugar, an instructor at the same institution. Speaking at the annual conference of the American Educational Research Association in Philadelphia, the Schugars reported the results of a study in which they asked middle school students to read either traditional printed books, or e-books on iPads. The students’ reading comprehension, the researchers found, was higher when they read conventional books. In a second study looking at students’ use of e-books created with Apple’s iBooks Author software, the Schugars discovered that the young readers often skipped over the text altogether, engaging instead with the books’ interactive visual features. Parents and teachers should look for e-books that enhance and extend interactions with the text, rather than those that offer only distractions. This is especially true of what the authors call some e-books’ “gimmicks and distractions.” In the book Sir Charlie Stinky Socks and the Really Big Adventure, for example, kids can touch “wiggly woos” to make the creatures emit noise and move around the screen. In another e-book, Rocket Learns to Read, a bird flutters and sounds play continuously in the background. Such unnecessary flourishes can interrupt the fluency of children’s reading and cause their comprehension to fragment, the authors found. They can also lead children to spend less time reading overall: One study cited by Smith and the Schugars reported that children spent 43% of their e-book engagement time playing games embedded in the e-books, rather than reading the text. Once the e-books are selected, parents and teachers must also help children use the e-books effectively, write Smith and the Schugars. This can include familiarizing children with the basics of the device. 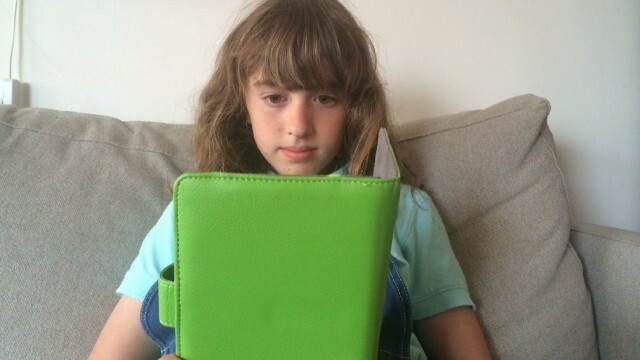 Although adults may assume that their little “digital natives” will figure the gadgets out themselves, the researchers have found that children often do need adult guidance in operating e-readers. Parents and teachers should also assist children in transferring what they know about print reading to e-reading. Kids may not automatically apply reading skills they’ve learned on traditional books to e-books—and these skills, such as identifying the main idea and setting aside unimportant details, are especially crucial when reading e-books, because of the profusion of distractions they provide. Lastly, adults should ensure that children are not over-using e-book features like the electronic dictionary or the “read to me” option. Young readers can often benefit from looking up the definition of a word with a click, but doing it too often will disrupt reading fluidity and therefore comprehension. Even without accessing the dictionary, children are able to glean the meaning of many words from context. Likewise, the read-to-me feature can be useful in decoding a difficult word, but when used too frequently it discourages kids from sounding out words on their own. Research shows that children often read e-books “with minimal adult involvement,” Smith and the Schugars note. While we may assume that interactive e-books can entertain children all by themselves, it turns out that such products require more input from us than books on paper do.